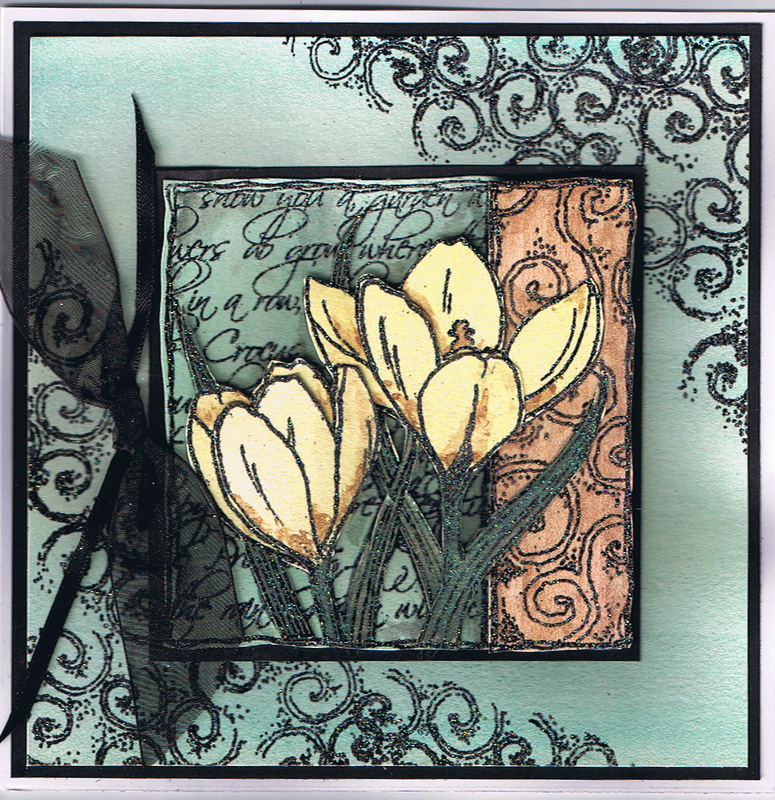 We thought we would start the new year on an optimistic note with some gorgeous samples of the new Spring Decoupage Stamps. As most of you will know by now we are so lucky with our Creative Director Jayne as she is a really talented artist and crafter of many years standing and she has been working really hard on samples for the up and coming show on QVC on 27 January. By the way the time has changed from the one advertised on the back of Craft Stamper Magazine from 7.30pm to 6.00pm. We thought it would be nice to show you some of the samples that you will see on the Show because as we all know we have a matter of seconds on the Show and it isn't easy to pick up on the finer points, so at least here you can look at your leisure! 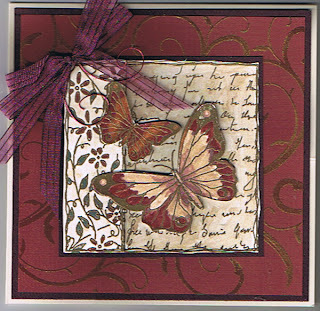 So here you can see the Butterfly and the Crocus sets. I just love the richness of the Butterfly card and the butterflies are painted with the Mica Powders mixed with the Magi Glaze. Just put a dab of the Mica Colour on your craft mat and mix it to a gloopy mix with some Magi Glaze. Either stamp out a butterfly onto heat embossable acetate and gold emboss and then paint in or stamp with Black Staz-On and paint in. Cut out and mount up - beautiful! 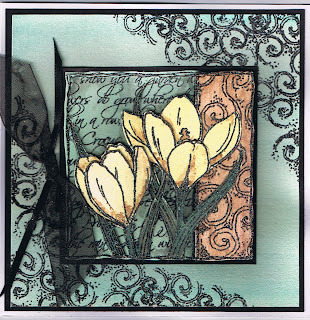 For the crocus Jayne has created the background with the Pearly Pallets using the Chinese brush stroke technique. If you look back to older posts you will see Jayne has done a really detailed step by step tutorial for this technique. Have a go because it is just so easy and really effective and a brilliant way to use up bits of dodgy coloured card. Once you have had a go I guarantee you will love it. This is where having a really talented artist like Jayne who is also a really passionate crafter is such a bonus because she can use artist brush stroke techniques and turn them into brilliant crafting techniques which we can all use in our papercrafting. I am always hearing Crafters say I'm not artistic and I can't do 'arty farty' things, ......... well you can now with this technique. If you do nothing else this weekend, get a pearly pallet and a large soft brush, spritz your pallet really well, wet your brush and using just 2 colours swish and swirl some colour onto any old bits of card you have in your stash box, wait until it dries (about 30 to 40 mins)and look how beautiful the colours are. It really is one of the most effective and easy to create background techniques you will ever try.